How do you know if a wetland is healthy? How do you know if a wetland is under threat? And how do you take appropriate action to avert that threat? Monitoring – long-term, repeated data collection – is the foundation for managing and understanding wetlands and the lives they support. 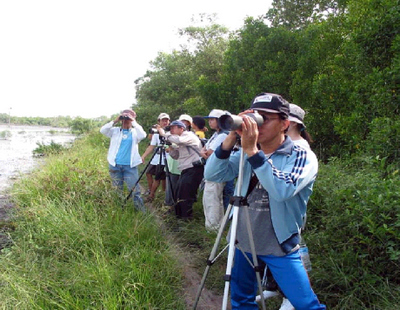 We coordinate one of the largest and longest running monitoring programmes in the world, the International Waterbird Census (IWC). Waterbirds are a key part of wetland ecosystems. Their presence, numbers and trends at a site can tell us a lot about the health and quality of a wetland. Waterbirds have an important social function, providing food, recreation and tourism opportunities. Waterbirds connect wetlands and people across cultures and borders, they are a shared wonder of the natural world. The IWC supports many aspects of the work we do to conserve waterbirds and the wetlands they depend upon – from conservation status assessments; to the identification, designation and monitoring of important sites; and providing the international context for managing species at a national or local level. Who contributes to the IWC? How are the counts conducted? What sites and species are counted under the IWC? The major contributors to waterbird monitoring are volunteer birdwatchers who participate because they find counting birds enjoyable and rewarding. Many thousands of volunteers join the count every year, making it one of the largest citizen science programmes in the world. In most countries the census is coordinated professionally, and in many countries professionals also carry out much of the fieldwork (although often on a voluntary basis). We also work closely with organisations implementing special species or regionally focused waterbird monitoring programmes. See the full list of national coordinators. Various waterbird populations require different monitoring schemes. The International Waterbird Census requires a single count at each site which should be repeated every year. The precise dates vary slightly from region to region but take place in January or February. Additional July counts are organised for the Neotropics and in Africa to monitor intra-continental migrants. Some groups of species such as geese, swans, seaducks, and waders on agricultural areas require special counts, which are organised in collaboration with the relevant Wetlands International-IUCN SSC Specialist Groups. Non-breeding counts are also complemented by counts during the breeding season coordinated by our partner organisations such as the European Bird Census Council or programmes such as the Arctic Breeding Bird Survey. Standardisation is a key principle for IWC counts. It is important that the same sites are covered in the same way each winter to maximise the validity of comparisons of counts from year to year. At the national level, national coordinators play a pivotal role in standardising counts in their countries and counters are encouraged to get in touch with their respective national coordinators to find out more about collecting and submitting data. All types of natural and man-made wetlands, including: rivers, lakes, reservoirs, ponds, freshwater swamps, mangroves, mudflats, coral reefs, rice fields and sewage farms that are covered by the Ramsar Convention. The species counted include all types of waterbirds regularly encountered at wetlands, including: grebes, cormorants, pelicans, herons, egrets, storks, ibises, spoonbills, flamingos, ducks, geese, swans, cranes, rails, jacanas, shorebirds, gulls, terns and skimmers. In addition raptors, kingfishers and other birds largely dependent on food resources in these habitats are often reported. Support your national network: join the counts, help train new counters or provide funding or logistical support to ensure the counts can go ahead. Contact your national coordinator to get involved. Make connections throughout flyways: help produce regional analyses (researchers can ask for IWC data by completing and returning the IWC Data Form), build bilateral relationships with countries and sites in need of technical and financial support along the flyway. Protect critical sites: collect information to promote the designation of critical sites as Ramsar Sites and lobby decision-makers to nationally protect areas. Get involved in the conservation of your local wetlands as a volunteer. 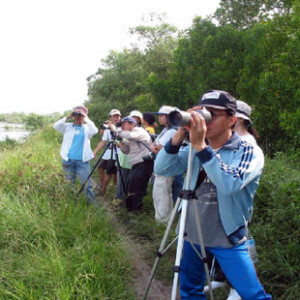 Raise awareness: engage with the private sector, students, hunters, and the wider public – host events in wetland reserves, conduct birding tours or hold photo competitions. Show the importance of waterbird monitoring for the sustainable management of your sites and use social media to spread the message. Get in touch! We will be happy to help with any queries you have.